Serving thousands of hungry South Shore residents each year – one of Greater Boston’s largest food pantries. Homelessness prevention for hundreds of local families every year. Educating food pantry clients about vital life skills. An initiative to increase community gardening and to supply food pantries with healthy food. Outfits low-income job seekers with free professional attire. Mental health counseling for adults, children, couples, and families. Accepting most forms of health insurance. A boutique-style shop, open to the community, and operated entirely by volunteers. All sales benefit Interfaith’s programs. 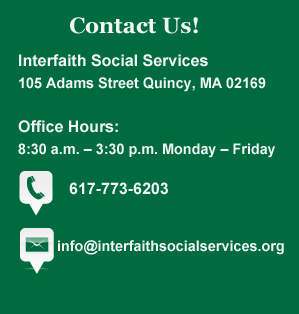 Interfaith has a variety of programs throughout the year for different seasonal initiatives. Click here for a full listing. Hundreds of volunteers serve within Interfaith’s programs each year. Many are involved in direct client and customer service through the Pantry Shelf, Career Closet, and Bureau Drawer Thrift Shop. Others are active as office volunteers and organizers for our fundraising events, not to mention our Board of Directors and its various committees. Quincy, Milton, Holbrook, Randolph, Braintree, Weymouth, Hingham, Hull, Cohasset and Scituate.